Apple Has Good Sales News For Wall Street : The Two-Way Investors expected a slowdown in iPhone 7 sales but they were up 1.6 percent year-over-year. Apple also enjoyed iPad and Mac sales well ahead of the overall industry for computers and tablets. 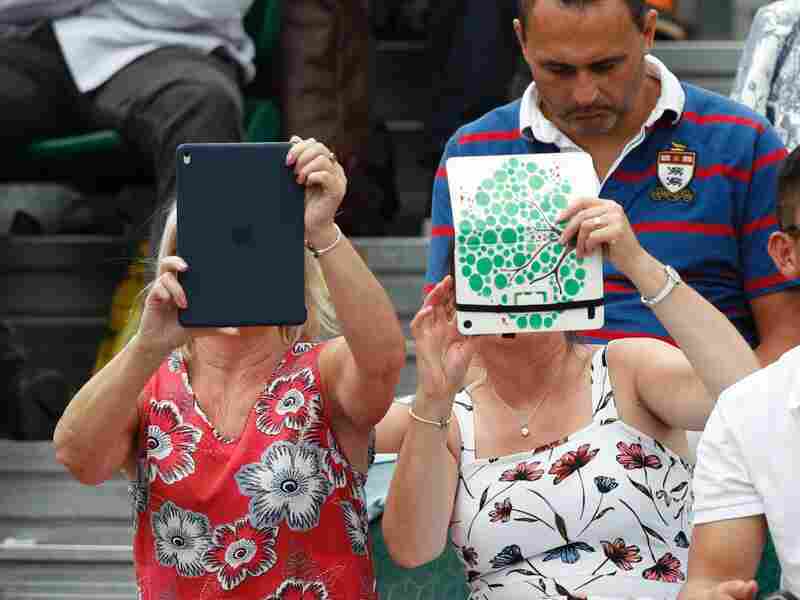 A spectator at Wimbledon last month uses an iPad to take pictures of the action. Improved sales of the tablets were part of the good news out of Apple's quarterly report. Apple also saw a rise in iPad and Mac sales, which were well ahead of overall industry sales of computers and tablets. In an earnings call CEO Tim Cook attributed it to upgrades in both lines. The iPad also has a lower-priced introductory model for $329 and a higher-end iPad Pro, for work. Cook also cited schools as a growing market for the product. The company did well in services such as cloud storage, the app store and streaming music. Cook looked ahead and said that Apple will be releasing more original content through Apple music in the coming months. The company is trying to regain its dominance in music. While its iTunes store was once the leader, downloads are down and streaming service Spotify is dominant. Apple says its own streaming service is growing but it has not released numbers. Cook addressed some political issues during the call. He was asked about Apple's recent decision to comply with a Chinese government request to take VPN apps — basically software that hides communications from government and other sources — out of the app store in China. Cook said the company follows the law in countries where it sells products. Looking forward, he suggested the Chinese would back away from the requirement because VPNs are needed for innovation. Cook was asked about President Trump's push for Apple to build three new factories in the U.S. Cook did not respond directly, but he pointed to a $1 billion manufacturing fund. He said Apple has already put tens of millions of dollars into a Corning plant in Kentucky, which will make glass for Apple products. Cook also talked excitedly about Apple's investment in augmented reality. The most popular use so far was the game Pokémon Go, which had people running around looking for monsters projected onto the real world through the camera of their phone. Apple will add AR to its mobile operating system later this year and developers are working on new uses for consumers. Lastly, Cook said the company is very interested in "autonomous systems" the kind behind self-driving cars and, Cook suggested, other areas as well.